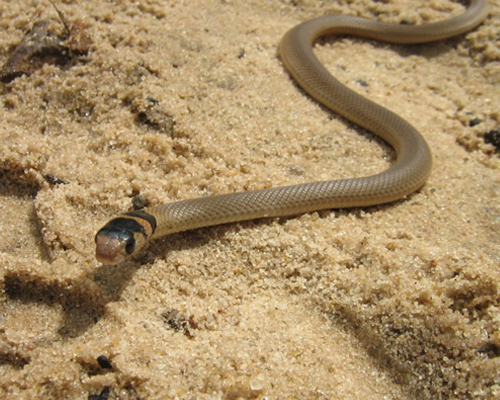 These baby brown snakes may look harmless but are just as venomous as an adult. With a distinct black marking on the head and collar they hatch at around 15cm in length and are generally light brown to orange. They feed on small lizards, frogs and insects. They can take up to 7 years to reach adult status depending on food source. The venom from brown snakes is highly deadly. The average venom yield is around 4mg (although the record venom yield was 67mg). The venom contains potent neurotoxins and procoagulants, resulting in progressive paralysis and incoagulable blood. Clotting defects may require multiple doses of antivenom for complete reversal. Occasional fatalities have occurred as a result of bleeding into the brain due to coagulation disturbances.